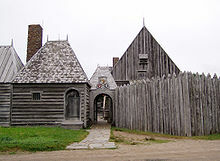 Replica of Port Royal habitation, located at the Port-Royal National Historic Site of Canada, Nova-Scotia. French interest in the New World began with Francis I of France, who in 1524 sponsored Giovanni da Verrazzano to navigate the region between Florida and Newfoundland in hopes of finding a route to the Pacific Ocean. In 1534, Jacques Cartier planted a cross in the Gaspé Peninsula and claimed the land in the name of Francis I. Despite initial French attempts at settling the region having ended in failure, French fishing fleets began to sail to the Atlantic coast and into the St. Lawrence River, trading and making alliances with First Nations. In 1600, a trading post was established at Tadoussac by François Gravé Du Pont, a merchant, and Pierre de Chauvin de Tonnetuit‎, a captain of the French Royal Navy. However, only five of the sixteen settlers (all male) survived the first winter and returned to France. In 1604, a North American fur trade monopoly was granted to Pierre Dugua Sieur de Monts. Dugua led his first colonization expedition to an island located near to the mouth of the St. Croix River. Among his lieutenants was a geographer named Samuel de Champlain, who promptly carried out a major exploration of the northeastern coastline of what is now the United States. In the spring of 1605, under Samuel de Champlain, the new St. Croix settlement was moved to Port Royal (today's Annapolis Royal, Nova Scotia) then abandoned in 1607. In 1608 Champlain founded what is now Quebec City, which would become the first permanent settlement and the capital of New France. He took personal administration over the city and its affairs, and sent out expeditions to explore the interior. Champlain himself discovered Lake Champlain in 1609. By 1615, he had traveled by canoe up the Ottawa River through Lake Nipissing and Georgian Bay to the center of Huron country near Lake Simcoe. During these voyages, Champlain aided the Wendat (aka 'Hurons') in their battles against the Iroquois Confederacy. As a result, the Iroquois would become enemies of the French and be involved in multiple conflicts (known as the French and Iroquois Wars) until the signing of the Great Peace of Montreal in 1701. "Carte geographique de la Nouvelle France" c. 1612/13 . The English, lead by Sir Humphrey Gilbert, had claimed St. John's, Newfoundland in 1583 as the first North American English colony by royal prerogative of Queen Elizabeth I. The English would establish additional colonies in Cupids and Ferryland, Newfoundland beginning in 1610 and soon after founded the Thirteen Colonies to the south. On the September 29, 1621, a charter for the foundation of a New World Scottish colony was granted by James VI of Scotland to Sir William Alexander. In 1622, the first settlers left Scotland. They initially failed and permanent Nova Scotian settlements were not firmly established until 1629 during the end of the Anglo-French War. These colonies did not last long: in 1631, under Charles I of England, the Treaty of Suza was signed, ending the war and returning Nova Scotia to the French. New France was not fully restored to French rule until the 1632 Treaty of Saint-Germain-en-Laye. This led to new French immigrants and the founding of Trois-Rivières in 1634, the second permanent settlement in New France. After Champlain’s death in 1635, the Catholic Church and the Jesuit establishment became the most dominant force in New France and intended to establish a utopian European and Aboriginal Christian community. In 1642, the Jesuit (Society of Jesus) sponsored a group of settlers, led by Paul Chomedey de Maisonneuve, who founded Ville-Marie, precursor to present-day Montreal. The 1666 census of New France was conducted by France's intendant, Jean Talon, in the winter of 1665–1666. The census showed a population count of 3,215 Acadians and habitants in the administrative districts of Acadia and Canada (New France). The census also revealed a great difference in the number of men at 2,034 versus 1,181 women. While the French settlers were established in modern Quebec and Nova Scotia, new arrivals stopped coming from France. By 1680 the French population was around 11,000 and the British vastly outnumbered them (by approximately 10:1) from the Thirteen Colonies to the south. From 1670, through the Hudson's Bay Company, the English also laid claim to Hudson Bay, and its drainage basin (known as Rupert's Land), and operated fishing settlements in Newfoundland. La Salle's explorations gave France a claim to the Mississippi River Valley, where fur trappers and a few settlers set up scattered settlements. French expansion challenged the Hudson's Bay Company claims, and in 1686 Pierre Troyes led an overland expedition from Montreal to the shore of the bay, where they managed to capture some areas. There were four French and Indian Wars and two additional wars in Acadia and Nova Scotia (see Father Rale's War and Father Le Loutre's War) between the Thirteen American Colonies and New France from 1689 to 1763. During King William's War (1689 to 1697) military conflicts in Acadia included: Battle of Port Royal (1690); a naval battle in the Bay of Fundy (Action of July 14, 1696); and the Raid on Chignecto (1696) . The Treaty of Ryswick in 1697 ended the war between the two colonial powers of England and France for a brief time. During Queen Anne's War (1702 to 1713), the British Conquest of Acadia occurred in 1710. Resulting in Nova Scotia, other than Cape Breton, being officially ceded to the British by the Treaty of Utrecht including Rupert's Land, that had been conquered by France in the late 17th century (Battle of Hudson's Bay). As an immediate result of this setback, France founded the powerful Fortress of Louisbourg on Cape Breton Island. Louisbourg was intended to serve as a year-round military and naval base for France's remaining North American empire and to protect the entrance to the St. Lawrence River. Father Rale's War resulted in both the fall of New France influence in present-day Maine as well as recognition the Mi'kmaq in Nova Scotia. During King George's War (1744 to 1748), an army of New Englanders led by William Pepperrell mounted an expedition of 90 vessels and 4,000 men against Louisbourg in 1745. Within three months the fortress surrendered. The return of Louisbourg to French control by the peace treaty prompted the British to found Halifax in 1749 under Edward Cornwallis. Despite the official cessation of war between the British and French empires with the Treaty of Aix-la-Chapelle; the conflict in Acadia and Nova Scotia continued on as the Father Le Loutre's War. The British ordered the Acadians expelled from their lands in 1755 during the French and Indian War, an event called the Expulsion of the Acadians or le Grand Dérangement. The "expulsion" resulted in approximately 12,000 Acadians being shipped to destinations throughout Britain's North American and to France, Quebec and the French Caribbean colony of Saint-Domingue. The first wave of the expulsion of the Acadians began with the Bay of Fundy Campaign (1755) and the second wave began after the final Siege of Louisbourg (1758). Many of the Acadians settled in southern Louisiana, creating the Cajun culture there. Some Acadians managed to hide and others eventually returned to Nova Scotia, but they were far outnumbered by a new migration of New England Planters who were settled on the former lands of the Acadians and transformed Nova Scotia from a colony of occupation for the British to a settled colony with stronger ties to New England. Britain eventually gained control of Quebec City and Montreal after the Battle of the Plains of Abraham and Battle of Fort Niagara in 1759, and the Battle of the Thousand Islands and Battle of Sainte-Foy in 1760. ↑ a b "Port-Royal National Historic Site of Canada". Parks Canada (Government of Canada). 2009. http://www.pc.gc.ca/eng/lhn-nhs/ns/portroyal/natcul/histor.aspx. Retrieved 2010-06-27. ↑ "1524: The voyage of discoveries". Verrazzano Centre for Historical Studies. 2002. http://www.verrazzano.org/en/index2.php?c=viaggioscoperte. Retrieved 2010-11-10. ↑ a b "Exploration — Jacques Cartier". The Historica Dominion Institute. http://www.histori.ca/minutes/minute.do?id=10123. Retrieved 2009-11-09. ↑ a b c Riendeau, Roger E (2007). A brief history of Canada. Facts on File, cop. p. 36. ISBN 9780816063352. http://books.google.ca/books?id=CFWy0EfzlX0C&lpg=PA36&dq=In%201600%2C%20a%20trading%20post%20was%20established%20at%20%5B%5BTadoussac%2C%20Quebec%7CTadoussac%5D%5D%2C%20but%20only%20five%20settlers%20survived%20the%20winter.&pg=PA36#v=onepage&q&f=true. Retrieved 2010-08-11. ↑ a b Vaugeois, Denis; Raymonde Litalien, Käthe Roth (2004). Champlain: The Birth of French America. Translated by Käthe Roth. McGill-Queen's Press. pp. 146, 242. ISBN 0773528504. http://books.google.com/books?id=ZnE0tjj9MbgC&pg=PA242&lpg=PA242&dq=%22Hendrick+Lonck%22. Retrieved 2010-06-20. ↑ Hodge, Frederick Webb (2009). Handbook of American Indians North of Mexico, Volumes 2–4. Digital Scanning. p. 585. ISBN 1582187487. http://books.google.ca/books?id=68ERQ9fkyTMC&lpg=PA585&dq=Iroquois%20came%20into%20conflict%20with%20another%20Iroquoian%20people%2C%20the%20Wendat%2C%20known%20also%20as%20the%20'Hurons'&pg=PA585#v=onepage&q&f=true. Retrieved 2010-04-15. ↑ Havard, Gilles; Aronoff, Phyllis; Scott, Howard (2001). The Great Peace of Montreal of 1701: French-native diplomacy. ISBN 0773522093. http://books.google.ca/books?id=YOQE3_sDJP0C&printsec=frontcover&dq=Great+Peace+of+Montreal#v=onepage&q&f=true. Retrieved 2010-06-23. ↑ "Gilbert (Gylberte, Jilbert), Sir Humphrey". Dictionary of Canadian Biography Online. University of Toronto. May 2, 2005. http://www.biographi.ca/EN/ShowBio.asp?BioId=34374. Retrieved 2011-09-10. ↑ Hornsby, Stephen J (2005). British Atlantic, American frontier : spaces of power in early modern British America. University Press of New England. pp. 14, 18–19, 22–23. ISBN 9781584654278. ↑ a b Fry, Michael (2001). The Scottish Empire. Tuckwell Press. p. 21. ISBN 184158259X. ↑ "Charles Fort National Historic Site of Canada". Parks Canada. 2009. http://www.pc.gc.ca/lhn-nhs/ns/charles/natcul/natcul3.aspx. Retrieved 2010-06-23. ↑ Kingsford, William (2008 Volume 1). The history of Canada. BiblioLife. p. 109. ISBN 1147810478. http://books.google.ca/books?id=IBUwAAAAYAAJ&pg=PA109&lpg=PA109&dq=Treaty+of+Saint-Germain-en-Laye+%281632%29#v=onepage&q&f=true. Retrieved 2010-08-23. ↑ Powell, John (2005). Encyclopedia of North American immigration. Facts On File. p. 67. ISBN 0816046581. http://books.google.ca/books?id=VNCX6UsdZYkC&pg=PA67&dq=Trois-Rivi%C3%A8res+the+second+permanent+settlement+in+New+France#v=onepage&q&f=true. Retrieved 2010-10-10. ↑ Shenwen, Li (2001). Stratégies missionnaires des Jésuites Français en Nouvelle-France et en Chine au XVIIieme siècle. Les Presses de l'Université Laval, L'Harmattan. p. 44. ISBN 2747511235. ↑ Miquelon, Dale. "Ville-Marie (Colony)". The Canadian Encyclopedia. http://www.thecanadianencyclopedia.com/index.cfm?PgNm=TCE&Params=A1ARTA0008371. Retrieved 2010-06-23. ↑ "(Census of 1665–1666) Role-playing Jean Talon". Statistics Canada. 2009. http://www.statcan.gc.ca/kits-trousses/jt2-eng.htm. Retrieved 2010-06-23. ↑ "Statistics for the 1666 Census". Library and Archives Canada. 2006. http://amicus.collectionscanada.gc.ca/aaweb-bin/aamain/itemdisp?sessionKey=999999999_142&l=0&d=2&v=0&lvl=1&itm=30327415. Retrieved 2010-06-24. ↑ "Estimated population of Canada, 1605 to present". Statistics Canada. 2009. http://www.statcan.gc.ca/pub/98-187-x/4151287-eng.htm. Retrieved 2010-08-26. ↑ Andrew Neil Porter (3 March 1994). Atlas of British overseas expansion. Routledge. p. 60. ISBN 978-0-415-06347-0. http://books.google.com/books?id=q8EOAAAAQAAJ&pg=PA60. ↑ "Our History: People". Hudson's Bay Company. http://www.hbc.com/hbcheritage/history/people/explorers/samuelhearne.asp. Retrieved 2007-11-14. ↑ Marsh, James (1988). Troyes, Pierre de. The Canadian Encyclopedia. p. Volume 4, p.2196. http://www.thecanadianencyclopedia.com/index.cfm?PgNm=TCE&Params=A1ARTA0008139. Retrieved 2010-04-25. ↑ Grenier, John (2008). The far reaches of empire: war in Nova Scotia, 1710–1760. University of Oklahoma Press. pp. 21–30, 123–125. ISBN 9780806138763. http://books.google.ca/books?id=jVG5h6G5fWMC&pg=PA123&dq=Raid+on+Chignecto#v=onepage&q&f=true. Retrieved 2011-11-03. ↑ Mark Zuehlke; C. Stuart Daniel (14 September 2006). Canadian Military Atlas: Four Centuries of Conflict from New France to Kosovo. Douglas & McIntyre. pp. 16–. ISBN 978-1-55365-209-0. http://books.google.com/books?id=KyNlm8SuplEC&pg=PA16. Retrieved 7 November 2011. ↑ John G. Reid (2004). The "conquest" of Acadia, 1710: imperial, colonial, and aboriginal constructions. University of Toronto Press. pp. 48–. ISBN 978-0-8020-8538-2. http://books.google.com/books?id=MqJ9qFqWK4IC&pg=PA48. Retrieved 7 November 2011. ↑ Alan Axelrod (23 April 2007). Blooding at Great Meadows: young George Washington and the battle that shaped the man. Running Press. pp. 62–. ISBN 978-0-7624-2769-7. http://books.google.com/books?id=7EBKOCt_P0EC&pg=PA62. Retrieved 7 November 2011. ↑ "History of Louisbourg". The Fortress Louisbourg Association. 2008. http://www.fortressoflouisbourg.ca/Overview/mid/12. Retrieved 2010-06-09. ↑ Raddall, Thomas H (1971). Halifax, Warden of the North. McClelland and Stewart Limited. pp. 18–21. ISBN 1551090600. http://www.ourroots.ca/page.aspx?id=1105466&qryID=56f6a64c-ac1e-45ad-85c1-f40e945f6a7e. Retrieved 2011-01-13. ↑ John Grenier (2008). The far reaches of empire: war in Nova Scotia, 1710-1760. University of Oklahoma Press. pp. 138–140. ISBN 978-0-8061-3876-3. http://books.google.com/books?id=jVG5h6G5fWMC&pg=PA138. Retrieved 6 November 2011. ↑ Jobb, Dean (2005). The Acadians: A people's story of exile and triumph. Mississauga (Ont. ): John Wiley & Sons Canada. p. 296. ISBN 0-470-83610-5. http://books.google.ca/books?id=bzksi8dKPCsC&lpg=PP1&dq=The%20Acadians%3A%20A%20people's%20story%20of%20exile%20and%20triumph%2C&pg=PP1#v=onepage&q&f=true. Retrieved 2011-01-16. ↑ a b c Lacoursière, Jacques (1995). Histoire populaire du Québec, Tome 1, des origines à 1791. Éditions du Septentrion, Québec. p. 270. ISBN 2-89448-050-4. http://books.google.ca/books?id=hbrS3bYEzKoC&lpg=PP1&dq=Histoire%20populaire%20du%20Qu%C3%A9bec%2C&pg=PP1#v=onepage&q&f=true. ↑ Mary Beacock Fryer (1993). More battlefields of Canada. Dundurn Press Ltd.. pp. 161–. ISBN 978-1-55002-189-9. http://books.google.com/books?id=543kHhH_ZYQC&pg=PA161. Retrieved 6 November 2011. This page was last edited on 22 February 2012, at 21:25.